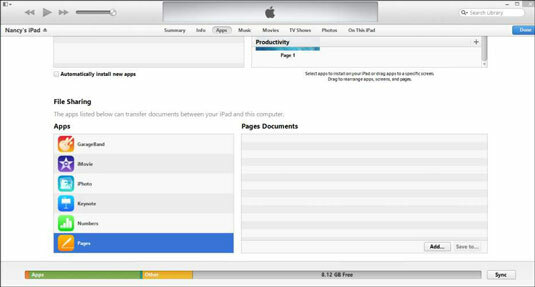 You can move files to and from iTunes on your iPad to your computer with a cable or, in iOS 5 and later, with a Wi-Fi connection. You can also use utility programs such as Dropbox to manage files, which is sometimes simpler and avoids certain constraints imposed by Apple-centric iTunes. In iOS 5 and later, you can sync between your iPad and your computer using a Wi-Fi connection rather than a cable. On the iTunes Summary screen, select Sync with This iPad over Wi-Fi under Options. If you have that option turned off or do not want to use it, you can connect your iPad to your computer with a cable. Select the Apps tab from the group of tabs running across the top of the pane as shown in this figure. If you’re running iTunes with the Mavericks OS on a Mac, you won’t see an Info tab to the left of the Apps tab.